Indigo Gabbro is a relatively new crystal mined ONLY in Madagascar and a few locations in Alaska. Anything else that has the ‘Gabbro’ label is more than likely a blend of black and white minerals, but will not be the specific mix that makes Indigo Gabbro what it is and is therefore a different crystal. 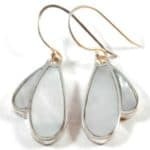 Merlinite ~ a modern name given to a a mix of agates containing dendrite, agate and/or opalised agate. Anything dendritic looks like it has moss, tree or leaf like inclusions. 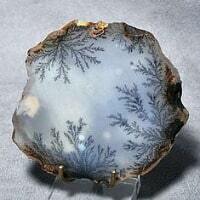 Sometimes the stone is called Dendritic Agate or Dendritic Opal, although this is not the pure form of Opal. 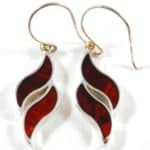 Merlinite is not a classified mineral name, it is a label given to this particular form of mixed agates. Indigo Gabbro ~ is a combination of several minerals such as chlorite, muscovite, serpentine, feldspar, magnetite and several other lesser known minerals & metals elements in a dark grey matrix. Mystic Merlinite (TM) ~ is Indigo Gabbro under a trademarked name, which often triples the price. Please do not buy Mystic Merlinite unless you’re absolutely drawn to it as you’ll simply be paying over the odds for a piece of Indigo Gabbro. Indigo Gabbro is not an expensive crystal. The label ‘Indigo’ came about as Indigo Gabbro has the most beautiful mix of colours from pale indigo all the way through to jet black. The word ‘Gabbro’ pertains to a group of igneous rocks formed of quartz that are laden with magnesium and iron. These types of rocks make up a large part of the Ocean’s crust and are similar chemically to Basalt, but are completely different in look, weight and energy. On a spiritual level, Indigo Gabbro is wonderful as it supports us in bringing our spiritual practices/beliefs into physical reality. Many people struggle when they have a spiritual awakening or start to explore a spiritual path. Often, their friends & family will have no idea about or interest in ‘spirituality’, so they hide their experiences and spiritual gifts and keep them separate from their day to day lives. 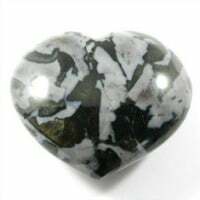 Indigo Gabbro brings strength and teaches us how to slowly but surely, bring our spiritual beliefs & practices into our home, our relationships and our work so these various aspects of our lives can work in harmony and support each other. Indigo Gabbro is a fabulous spiritual tool as it amplifies higher energies, making it easier for us to connect to the Spirit world for tarot, readings, mediumship, channelling and trance. This brings clarity to our spiritual gifts, our intuition and anything that we may need to remember on a soul level. 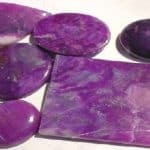 The reason I’m blogging about this particular stone is that it’s energy seems to both ground and amplify, giving us whatever is needed most at the time. If we need grounding, that is what Indigo Gabbro will do with many clients feeling the energy at the base of the spine or feet. For those who are firmly grounded, Indigo Gabbro will raise their vibrations and it’s energy will most likely be felt around the head area. Indigo Gabbro brings together the dark/shadow/subconscious sides and the light/open/conscious sides of ourselves. It works on a mental, emotional and spiritual level to bring balance. Many of us struggle with the negative aspects of ourselves, often projecting them on to others or beating ourselves up about them. Working with Indigo Gabbro ensures we remain fully conscious and aware of the less loved parts of ourselves and are supported in accepting and integrating them. Often, in the shadows, lie our deepest gifts. As a stone of integration, Indigo Gabbro helps us to balance our past and present alongside the other balancing properties mentioned above. This is really helpful when we’re trying to move on from the past, but it’s still causing us problems in the here and now. Indigo Gabbro has quite a strong energy and is a wonderful blend of both masculine & feminine energies. One day it might feel really solid and masculine, the next it might feel really light, sparkly and girlie. I like that working with it tells me what energy space I’m in the minute I hold it ~ if you can feel energies on that level, it’s a great indicator! On a physical level, Indigo Gabbro is said to help alleviate the symptoms of menopause, fevers, immune system disorders and infection. I have read that it also reduces swelling, bruising and sprains, but haven’t personally had anyone experience this yet. 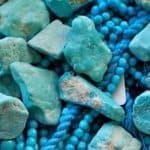 With the absence of copper, which is the natural anti-inflammatory element present in Malachite and Chrysocolla or Manganese, which is present in Sugilite, I do question the legitimacy of this crystal being anti-inflammatory. If anyone has any personal experience of this, please comment below as I’d be really grateful for any feedback. The best way to work with Indigo Gabbro is consistently. Because it can alternate in what it is doing for us from day to day, there is no particular ‘box’ I can put it in ~ if you’re drawn to it, it will be whatever you need it to be at that time…and the next…and the next. 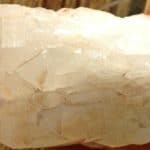 By working with it consistently over a period of weeks, you can really connect to this crystal and use it as a personal energy guide. I often won’t know what sort of energy I’ll be needing or working with on any given day, but can get a good idea by what crystals I’m guided to carry or by using Indigo Gabbro! As as aside, I take all of my crystals off at night in order to allow my body to settle back down into it’s natural, base vibration. This gives my system the opportunity to rest and rejuvenate. Whatever crystals I add the next day then have full impact. If we wear a crystal for too long, it’s energy blends, integrates & becomes part of our base vibration. This means it may no longer have the desired effect we were hoping for because our system is simply too attuned to/used to it. The only exception is if I want to be protected at night, to consciously dream & be able to interpret those dreams, if I was suffering from insomnia or wanted a crystal to work on my physical body whilst sleeping. Everyone is different and I know a lot of people whom sleep with a whole bunch of crystals and that’s cool ~ on a personal level, I need to take myself back down to base energy on a daily basis in order to accurately feel/sense any energetic changes when waking up the next morning. I hope you’ve enjoyed this blog ~ have the most fabulous day! 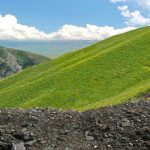 I just received my first piece of Indigo Gabbro today and stumbled upon this blog today when I was looking up its attributes. 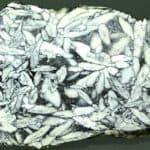 Let me say, this is a wonderful blog on the mineral and highly accurate. It does sparkle for me and I have felt the tingles. Let me add, I have worked with crystals for years and this one is very unique. Highly recommend. Holding my Indigo Gabbro now and feeling so much more informed and reminded of its beauty and strength. Cosmic cuddles to you too!!!!! !